You don't have to be a world traveler to bring the world into your space. It’s summer, aka, time to travel. But while we can’t all be jetsetters like seasoned pro Lea Michele, there are definitely ways to make your home feel like its very own well-traveled oasis. Who ever said you have to see the world to bring some global flavor home? Thanks to tons of online shops that support local merchants worldwide, there are plenty of outlets that provide beautiful, handmade, ethically-sourced decor from around the globe, making the style a lot more attainable than you may think. At its very core, globally-inspired decor stems from the idea of appreciating worldly cultures. Yet, even though it’s made its mark as a highly sought-after style that’s coveted by both amateurs and pro designers alike (just check out Etsy’s summer decor trend), there doesn’t seem to be a definitive explanation for what it is, or how you can get it. 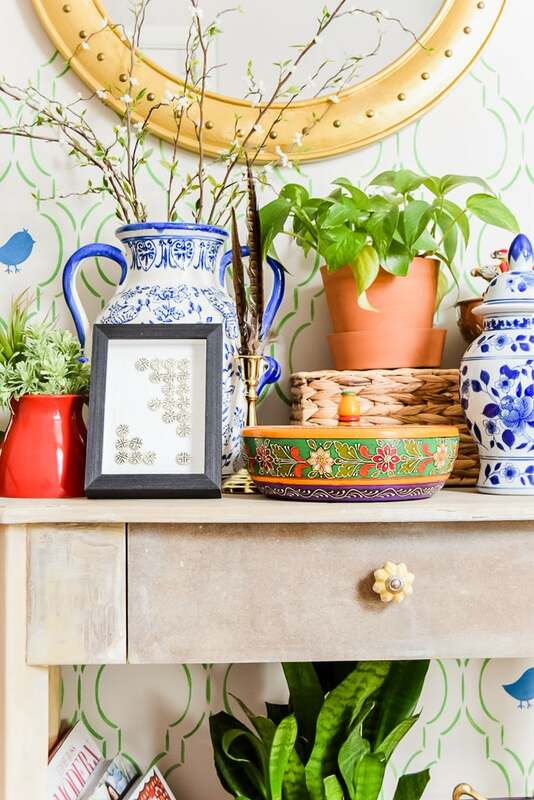 Ahead, we compiled a how-to guide that touches on how to properly execute this culturally relative style, with a little help from the master of global decor herself, Stephanie Watkins of Casa Watkins Living. Here’s living proof that you don’t even need to leave your hometown to get that worldly feel (but can certainly trick people into thinking you did). First things first: What counts as global? Well, for starters, as the name suggests, the style draws inspiration from around the globe, and is the intersection of culture and design. The aesthetic is rooted in an appreciation for cultural groups, and an admiration of the artifacts created by those cultures. While you might be quick to think that global decor items just include textiles, baskets, bowls, or trays, it encompasses everything from furniture to clothing (and so much more). It’s anything that’s been handmade by a skilled artisan abroad. They key here is authentic, handmade pieces that have been ethically sourced using fair trade principles (those that pay fair prices to producers in developing countries). They can range in make, material, origin, and more. Supporting these artisans is a vital component to accurately bringing this style home. “My favorite aspect of global style is that you can incorporate all those wonderful souvenirs from your travels, purchase authentic pieces from globally sourced shops, or create your own globally inspired pieces,” Watkins tells Domino. But we’d like to go on the record here and say that there is no one right way to execute global style. In fact, the term “global” may look different in different countries. One place’s traditional equals another place’s exotic. How can I bring it home, without leaving home? Photography by Dabito. See his full New Orleans home here. Another serious misconception is that global decor is overly expensive. “You will be surprised to find that many authentic global pieces are just as inexpensive as globally inspired decor from commercial stores,” says Watkins. And while we totally understand the importance of affordability, you should also be aware of what you’re paying for. If you’re satisfied getting the look for less at a big brand store, that’s great. But be aware that authentic, ethically sourced products handmade by worldwide artisans use the highest quality materials. So, if you’re buying them online and having them brought to the US, they’re likely to cost a bit more. If you chose to get authentic global decor shipped to your door (like the many of us not lucky enough to travel all the time do), make sure you’re shopping around the right places. Luckily, there are several online shops that make it a point to outline fair trade on their home pages, and have a mission to properly serve global artisans around the world. The Little Market offers a non-profit model founded by women in order to empower women, meaning that they don’t take a profit. Instead, they reinvest all of their proceeds into the communities of women they work with, both here in the US and across the globe. By partnering with artisan groups that provide employment and skill development opportunities for marginalized and underserved women, The Little Market creates opportunities for women as local as downtown Los Angeles and as far as Ghana to rise above poverty. Founded by Lauren Conrad and Hannah Skvarla in 2013, The Little Market’s wares can be found online, as well as in their soon-to-launch brick and mortar storefront. The Citizenry curates and sells premium small batch creations made by artisans from around the world. Each item is handcrafted, hand numbered, and available only in limited quantities, in order to ensure it’s as extraordinary as the culture that inspired it. Cost Plus World Market brings the beauty and excitement of global bazaars to you. One of our favorite under-the-radar furniture providers, World Market scours the globe for noteworthy goods that can be made accessible to us here at home. A continually changing selection ranges in terms of different sources and cultures, and all are at a reasonably affordable price point. VivaTerra not only provides ethically-sourced goods for your home and garden, but also sustainable, eco-friendly materials. One of Watkins’s named favorites, you can find everything from furniture to home accents and more, all made with natural materials. Woman Shops World Etsy is just one of many incredible merchants on Etsy, but definitely worth checking out. The globally curated handcrafted goods span from beads to tassels to textiles—a major selling point for Watkins, who DIYs a lot of her own goods. West Elm is already one of our favorite retailers, but did you know that all of its products are ethically sourced? West Elm’s wide selection of high-quality furniture and accessories is a major score for lovers of the brand, and something we can all feel good about supporting. But with that being said, don’t leave the DIY option out. You can recreate similar looking pieces with accents bought from global retailers (like the Etsy shop above), and hack your existing pieces with a bit of paint and elbow grease—this will make them blend in with your authentic goods. It’s all about balance. How do I style it? Instead of trying to focus on one culture or country of origin (there are so many diverse options! ), mix and match styles and pieces. This will give your home the most well-rounded, well-traveled look. In her own home, Watkins skillfully mixes Moroccan, Mexican, Indian, and other influences, preferring not to concentrate on a single culture, but creating a vibe that’s unique to her. “The beauty of global style is that it can be completely unique in how you mix the global decor,” she explains. Our tip? Just keep in mind that a well-edited collection of goods is key to creating a space that feels cultured, not cluttered. Moreover, the process of curating your space doesn’t have to happen overnight. “Let your space evolve organically by bringing in pieces that speak to your design aesthetic. Don’t shy away from a certain global decor item you’re eyeing, just because it doesn’t ‘match’ the other global pieces you have in a space. Mix global regions by coordinating them by color, pattern, or texture. There is always a way to make global decor mix and match,” Watkins advises. In the end, the international trend is about celebrating the diversity of products and materials available throughout the globe. So, whether you read this and book your next flight out in order to get your hands on some local home goods, or browse the globe’s offerings online, know there’s something thoughtful about styling your space with works of the world.